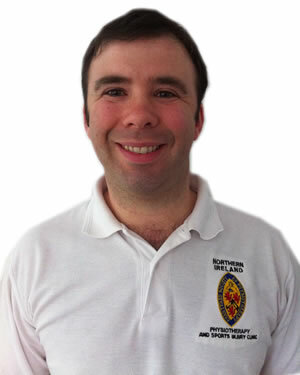 Belfast Physiotherapy clinic Northern Ireland Physiotherapy and Sports Injury Clinic is managed by Ross Harris BSc (Hons) PG Cert MCSP. Ross graduated from the University of Ulster at Jordanstown with a BSc (Hons) in Physiotherapy and has also attained a Post Graduate Certificate in Sports Physiotherapy. Ross also lectures on sports injuries and sports massage in Belfast. It is best to begin diagnosis and treatment as soon as possible following injury – the quicker treatment commences, the sooner you return to full health. So don’t suffer needlessly, simply contact us at our Belfast physiotherapy clinic in and we will make every effort to begin treatment within 24 hours of your call. The initial appointment involves a full assessment and treatment and will last approximately 45 mins. Our fee for this is £35. Each subsequent visit will cost £30, with sessions lasting 30-60 mins depending on the treatment required. Sports Massage Belfast will work with you to effectively reduce muscle tension throughout the body, relieve muscular pain and reduce the risk of injury. Regular sports massage will leave muscles in excellent condition, helping to improve daily function and sports performance. Our fee is £45 for a 1 hour massage. Discount is available for block booking here.